A fine early Austrian bronze. The statue depicts an Austrian mountaineer lifting his hat after reaching the summit. We suggest enlarging the photos and seeing the excellent detail with which the foundry has created the statue. 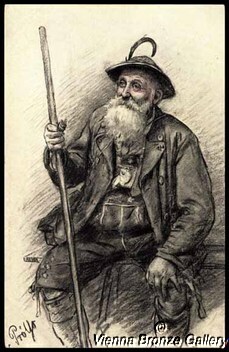 The mountaineer’s outfit is typical for that time, such as feather hat, loden jacket and leather pants (Lederhosen). *refers to a breathtaking mountain range south of Vienna called 'Rax' which is even nowadays a popular destination. For those who are interested in mountaineering we have a video for you about this outstanding place. Click here. It is still a big challenge even with modern equipment and climbing aids. Good, no restoration, no repairs, no touch ups! Please do not forget that you are buying a used item that always may show some traces of wear! It seems as if the walking stick was replaced at a later date. As reputable collectors for four decades we offer only authentic Vienna bronzes and fight copycats. Our customers know!